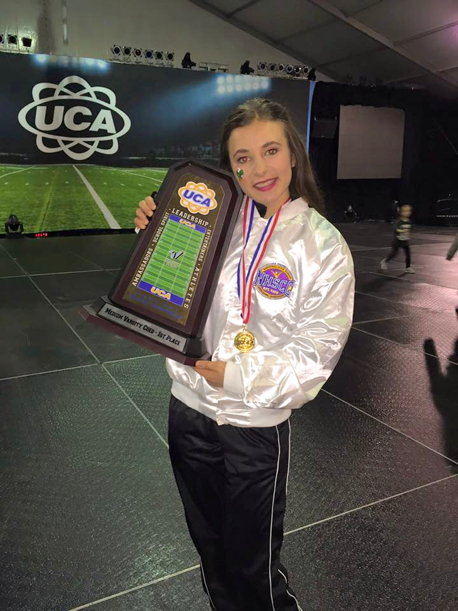 Home » News » High School National Cheer Champ to College ______? High School National Cheer Champ to College ______? Throughout high school, cheerleading was always something I was passionate about. I put countless hours into practicing and perfecting skills, while having the time of my life with teammates. It became part of who I was, and part of what others identified me as. Two of my proudest and most cherished moments were winning the UCA National High School Game Day Championship in Disney World my junior and senior year. Although cheerleading had always been a passion, I decided to not pursue it in college. I knew it was the right decision for me, even though I knew I would miss the sport. Once I started college, it was a new, fresh beginning. I could choose my own path and find a new passion. Seems easy, right? Wrong. It seemed that every person I met had it all figured out; lawyer, doctor, teacher, veterinarian, psychologist, the list goes on. I was, on the other hand, clueless. What was I passionate about? What could I see myself doing for the rest of my life? These questions all stumped me. I knew everything that I did not want to do, but for some reason I couldn’t find what I did want to pursue. Until I found UREC. Here’s how the story goes: I was scrolling through Instagram one day and there it was, a post by @LSUUREC (follow us, please ) announcing that they were currently looking for students to apply for a Street Team position. I headed to their website to see the full description of the job and immediately was interested and applied. Spoiler alert: I GOT IT!I started after Christmas break with no expectations. Starting at this new job, I was still unsure if the major I had chosen was something I could see myself being passionate about. The first semester as a Street Team Member completely convinced me. Work felt less like “work” than any job I had ever had. I had the opportunity of challenging myself to be more creative, learn new skills, and step outside my comfort zone. Needless-to-say, I found my passion. Working with a small group of people to create social media posts to engage and inform our audience of what’s happening at UREC has been such an eye-opening experience and really helped me define what my passions are. Define activities and interests that motivate you and bring you fulfillment. Sounds a bit complicated, but start simplistic such as working out, painting, sports, movies, etc… Having a good understanding of what brings you fulfillment and what you excel at is a good starting place. For me, I enjoy using social media to communicate with others. I also enjoy creating stories and serving others in whatever capacity I can. Realize that there is no “one” straight path to discovering your passion. Annoyingly enough, passions are often stumbled upon when you aren’t directly looking for them. Allow yourself opportunities to undertake a variety of experiences. This will aid in narrowing down your interests and potentially identifying your passions. I had to put myself out there, as nerve-racking and intimidating as it can be, and apply for a job that would challenge me and push me to grow and adapt. Most importantly, understand that You Can Do It. #NeauxLimits. Once you find your passion(s), set your goals and don’t underestimate what you can accomplish. As cliché as it sounds, it’s true; you can do anything you set your mind to.